HPSC released the tentative Exam date for Naib Tehsildar Exam 2019 for Advertisement No. 01/2015. 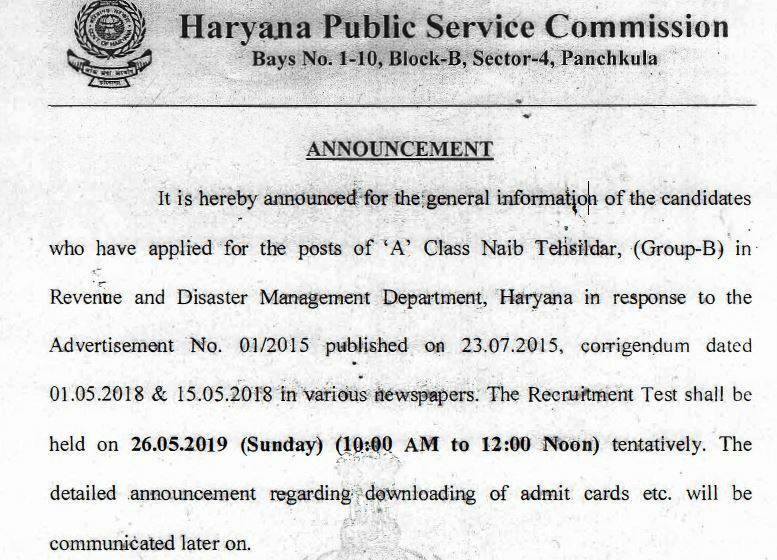 HPSC Naib Tehsildar exam date 2019: Haryana Public Service Commission has released the exam date for Advertisement No. 01/2015 HPSC Naib Tehsildar Exam 2019. Candidates who applied for the post of "A" class Naib Tehsildar (Group B) in revenue and disaster management Department, Haryana can check notification at the official website of the commission. As per notification released by the commission, the exam is scheduled to be held on 25 May 2019. The detailed announcement regarding Downloading of admit cards etc. will be ommunicated later on.